Hewlett-Packard has passed on the "one-size-fits-all" Chrome OS and loaded the more customizable Android 4.3 on its new Slate 21 Pro all-in-one. The PC, announced on Sunday, has a 21.5-inch screen that can display images at 1920 x 1080 pixel resolution. The desktop will ship in March starting at US$399 with a keyboard and mouse. 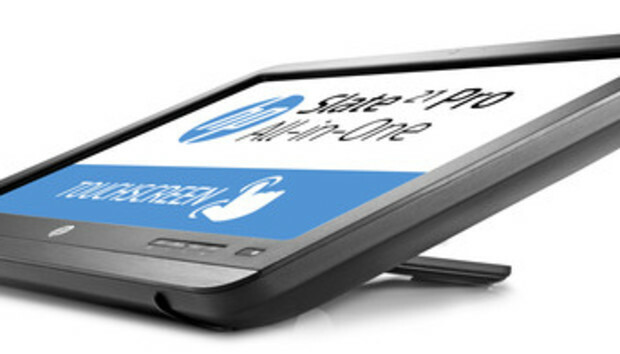 The Slate 21 Pro is HP's second Android all-in-one after the Slate 21 AIO for consumers shipped in June last year. The PC has a quad-core Nvidia Tegra 4 processor, 16GB of storage, 2GB of RAM and Wi-Fi. The all-in-one is designed for business users, and has a user interface much like those on Android smartphones and tablets. HP is hoping users will store most of their data in the cloud through online storage services such as Box.net and Google Drive, as users of mobile devices do. The limited storage and reliance on cloud make the Slate 21 Pro similar to competing Android PCs from Acer, Asustek and Lenovo, as well as to LG's Chromebase all-in-one, which uses the Chrome OS. OS flexibility, cost and customization features prompted HP to load Android on the desktop instead of Chrome OS, said Pavana Polineni Gadde, global product marketing manager at HP. Android is flexible and made more sense for this desktop than Chrome OS, which cannot be heavily customized for business customers and needs connectivity to be effective, Polineni Gadde said. "You need to have some kind of offline functionality, so you can do something with it even if it's not connected," Polineni Gadde said. The Slate 21 Pro has some offline functionality with Android, Polineni Gadde said. Moreover, Android offers flexibility to users who want fine-grained manageability and security features. HP has loaded Android with security features so system administrators have better control over the desktop in corporate environments. "With Chrome, Google owns everything," Polineni Gadde said. "You do not have independence to select any updates, or select how the device needs to be set up. You don't have any kind of customizations; it's one size fits all." HP has also tried to keep the Slate 21 Pro affordable at just around or under $400, and the all-in-one with Chrome OS would have been more expensive to build. "From Google's perspective, Chrome is the premium OS, so the bill-of-materials cost goes up," Polineni Gadde said. HP wants to offer users operating systems from Microsoft and Google in multiple devices. For users who want Chrome OS, HP offers Chromebooks with 11-inch and 14-inch screens, an HP spokesman said. The Slate 21 Pro comes with Kingsoft Office Suite to open Word, Excel and Powerpoint documents. The PC also doubles up as a touch monitor, and laptops can be connected through an HDMI port. An app called "Portrait" will help run applications written for small screens. HP will ship the desktop worldwide. A separate Android OS image will be loaded for the China market, where access to Google Play is not available. The PC maker also announced the ProOne 400 all-in-one, with a 21.5-inch screen. Offered with the ProOne 400 is a choice of Intel's latest Core, Pentium or Celeron processors based on the Haswell architecture. The screen displays images at a 1920 x 1080-pixel resolution, and features include DisplayPort monitor port, USB 3.0 ports and a webcam. The new all-in-ones are easily serviceable and parts can be easily interchanged, said Bob Ducey, category manager for all-in-ones at HP. The ProOne 400 AIO is priced started at $749 and will ship in March.